CHELTENHAM SATURDAY: Simon Nott reports from Festival Trials Day at Cheltenham – direct from the Star Sports pitch. On the track it was all about dreaming for further glory in March. In the ring, it was more of an immediate question. Would backers or layers come out on top during the afternoon? There’s always plenty of excitement from punters for Festival Trials Day, but as one explained to me before racing ‘there’s rarely been a season like it, punters are largely still in the dark with just weeks to go’. That’s the way the bookmakers like it of course, long may the form fog remain. There was no fog on course, more like drizzle which was forecast to become increasingly heavier rain as the day progressed. Pretty much everyone hoped the meteorologists knew as little as the punters. Today was Flynn’s, new head of on-course operations, first day on the pitch. He was thrown in at the deep end. It was two-fold jeopardy for the new guy. Lofty was 1.01 to be grumpy if the predicted precipitation was correct, worse than that, Ben was back in action after his Christmas break and Michelle had neglected to source and pack the boss’ ham and cheese rolls. Business being good tempered those drawbacks, the punters thought they ‘knew’ the winner of the opener. A steady queue of backers, readies in hand, snaked their way to the bookies, most of them backing Adjali from 7/4 into 5/4. The problem was, at least for the punters, that they didn’t know. Fakir D’Oudairies was a drifter from 3/1 to 4/1 but absolutely bolted up. Most books would have just had the jolly their only loser so delighted with just getting that one beaten. It’s often quite amusing to hear ‘seasoned’ racegoers versing new punters on the ways of the turf. Shortly after the first punters were getting in line to collect their winnings from the opener. One rails firm appeared to have more than their whack to pay out. I overheard a punter pass on some advice with some authority. ‘we should join this queue and back with this bookmaker, his odds on this race must be a lot better than everyone else’s. I suppose they could have been. Back at the joint Ben was giving Flynn a pep talk on the cusp of his career with Star Sports. The boss spotted me and called me over and smiled, ‘I have high hopes for this one’ patting a beaming Flynn on the shoulder, ‘I think he could be MD in 10 years’, Flynn beamed more. He then added the caveat, ‘That is as long as he’s not radicalised by ‘Bin Laden Lofty’. If this was a film script the camera would pan across to a scowling Lofty. He was scowling even more after the only, but bad, loser in the book Kildisart obliged in the second for the punters under Daryl Jacob. ‘4/1 into 7/2’ spat Lofty. It didn’t level things up it meant that the firm were now well behind. Ben had nipped up to entertain guests in the Star Sports box when they jumped off for the third. Lofty reported that it was a similar story to the previous race. It had been a good betting heat but two fair bets on Janika at 11/4 ensured that Nicky Henderson’s favourite was the only loser in the book going off at 5/2. It didn’t look good for the ledger coming to the last, the favourite appeared to have just come to collar long-time leader 6/1 Siruh Du Lac and Lizzie Kelly when a rather elaborate jump by the latter looked to have put paid to the race. The roar that went up from the crowd hinted quite strongly that they thought so too but Lizzie Kelly and Siruh Du Lac had other ideas. The partnership fought back tenaciously mugging Daryl Jacob of his double by a head on the line. ‘Ei Ei’ shouted Armaloft Alex (that’s how he spells Aye Aye, weird I know) friend and owner in the Nick Williams’ otherwise known as ‘The Genius of George Nympton, yard, ‘Poor Daryl, Lizzie’s done him again.’ Daryl may not have been happy, but it was all smiles on the pitch, yes even Lofty, Michelle unleashed the blueberry muffins in celebration. Julie Williams’, who bets under the name of her father Freddie, was missing from their number two Tattersalls pitch today. Sadder still was the news that Julie and husband Kevin have decided to sell both their Festival and Off pitches at the track. It’s certainly the end of an era. People will remember ‘Fearless Freddie’ doing battle with the higher-rollers at the Festival long after we are all gone. Legendary is certainly banded around too much but not so in prefixing Freddie Williams. The whole betting ring miss Julie and team, they went out on a high, the last meeting they bet at Cheltenham was the 14th December when Synopsis whom Julie and Kevin own a leg hosed in by 10 lengths, a fitting way for an era to end, Freddie would have loved it. The weather forecast was spot on, the promised rain had appeared by the time they set off for the fourth. The firm had two losers in the book, Terrefort and Frodon. The latter was the absolute, the ‘Bryony Frost’ factor is certainly a ‘thing’ on Saturday’s these days. Her fans’ faith certainly wasn’t misplaced today. She jumped the last looking the winner then half way up the run-in Frodon’s stride appeared to shorten as jolly Elegant Escape (and winner in the book) began to close looking very dangerous. However Bryony does it, she did it again, galvanising her mount to pull out a bit more and put the race to bed. It was a terrible result for the book but you can’t help but love Bryony, great for racing? Absolutely. Ben appeared just after the race, fresh from the box, dry, warm, fed and watered and enquired as to the state of Lofty’s face ‘Happy or otherwise?’ Well, you decide. (Lofty is the one in the middle). Ben certainly wasn’t expecting it, but out of the blue a genial Irishman not seen doing business since Royal Ascot approached the joint and calmly asked for £30,000 commission bet at 7/4 Birchdale. He got the wager. No sooner had he left Ben’s phone rang, the office had laid another lump the same horse. It was slightly reassuring to see Nicky Henderson’s gelding drifting on the machine, though of course if Star hedged into it, the story would possibly be different. Shortly before the off a punter came to the joint and backed the same horse, but to £20, the problem was ‘fat fingers’ meant he went away with a ticket that said £210 in error. The bet was cancelled, and the betting ring manager informed as is the procedure. Nobody ever wants potential confrontation so two reasons to get Birchdale beaten. Coming to the last it was a real race on between 6/4 favourite Brewin’upastorm and the bogie. Racegoers were robbed of the chance to witness a real ding-dong when the jolly came down at the last. This left Birchdale to coast home to an easy victory costing the firm untold bundles in the process. 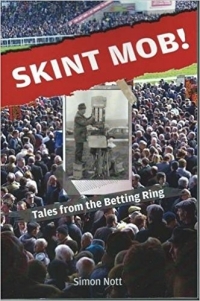 The betting ring manager positioned himself by the pitch in case the punter with the erroneous ticket tried to claim it. More often than not the punter will come up and just expect his justified winnings. Others can’t help themselves and try it on, the most used excuse is that ‘I had £200 for me and a tenner for the Mrs’ or the like. It appeared today’s punter couldn’t help themselves, so tried to help themselves. The tactic they used was to send in an ‘innocent’ to collect, someone who hadn’t struck the bet, had no idea what was going on and wouldn’t look guilty. Michelle on the pitch has been in the bookmaking game far too long. She just gave the punter the £55 his ‘mates’ had to come, he looked a bit bemused, but went on his way with what the ticket-holder(s) were due. Ben just looked up and with a grimace just uttered the word ‘punters’! Going into the penultimate a thought had to be spared for Paddy Power’s racecourse ambassador Paul ‘Binno’ Binfield. He was sporting a ‘confused’ look that tends to adorn the faces of those who usually wear glasses but are minus them. He didn’t want to go into too many details but an ‘incident’, one that I hasten to add was not of the mild-mannered press man’s doing, in a nightclub the previous evening had seen him, excuse the choice of words, with no bins, thus making peering like a oriental sniper his look for the day. I know, I was asking myself the same thing, what on earth was a man of his age doing in a nightclub! The penultimate was another nail in the coffin of a day already bludgeoned to death profit-wise by the over and above lump in the previous race. Emma Lavelle’s Paisley Park was the best-backed horse in the race with Star Sports on the rail and trounced its rivals ratcheting up another four red figures in the book. Ben had legged it and the rain had started to pour so it was hardly surprising that the crowd had dwindled for the tricky-looking concluding race. The market was still buzzing though, a punter came in with a carpet £300 for Champagne City at 10/1, steady money saw Flashing Glance take a tumble in price. Then a real blast from the past, trade money flooded into the ring for Flash The Steel, the 7/2 compressed to 3/1 under weight of the money. At the off, the book had too bad losers, the office monied last mentioned and Champagne City. Everyone on the firm breathed a sigh of relief when Fergal O’Brien’s 8/1 chance Benny’s Bridge came from an impossible looking position in last to triumph up the hill. If the firm had some on at the huge price it must have been in running they might even have gotten out on the day! As it was, it was nice to end the day on a winning note. They next stop for Star Sports on course is the Festival back here in March. Bring it on.